On April 5th. a Gandhian activist known as Anna Hazare started a 'fast unto death' to exert pressure on the Indian government to enact a strong anti-corruption act as in the Jan Lokpal Bill. The Jan Lokpal Bill or the Citizen's Ombudsman Bill is a draft anti-corruption bill that would create a Jan Lokpal, or an independent body (like the Election Commission) which would have the power to prosecute politicans and bureaucrats without government permission. Incidentally, the Lokpall Bill drafted by the government has failed to pass the Rajya Sabha for 42 years. Hazare's fast is fuelling a mass anti-corruption drive in India, and has roped in several hundred thousand supporters for the man, thanks to the Internet and social media. Techcircle.in takes a quick look at how Hazare is trending in the Web. Twitter â€“ The microblogging site has people sharing their 140-characters on Hazare, where the hashtag #hazare not only lists a whole bunch of tweets, but also shows updates as comments and thoughts are tweeted. Twitter is also the forum of choice for celebrities and the intelligentsia to share their two cents. Anna Hazare is the top trend of India in Twitter, and is followed by lokpal, Mera Neta Chor Hai, Corruption, and Jantar Mantar. Incidentally, IPL is also among the top trends of today. India may be wary of corruption and demanding change, but the cricket-loving nation refuses to forget the royal game, especially after the World Cup win. Anand Mahindra: This is a movement whose heart&voice cannot be ignored "@sundarsez: If only industry captains can voice their support for Anna Hazare"
Facebook â€“ There are several pages and communities on Hazare; with both the number of pages, and people who are getting involved increasing every hour. There are 146,855 members in the 'India Against Corruption' community. There are pages with 58,904 likes and pages with 38,202 likes to the more humble pages with 1,217 people on the Like list. The number of likes has exceeded 100,000; and remember these are mostly people joining in over the last couple of days. A quick look at some random comments from Facebook Walls (names have been removed). These posts are often not in English, as you will see, but in local languages written using the English script. User D: Unreal scenes in India -- "Gali Gali mein shor hai, mera neta chor hai". Chetan Bhagat's blog is actually pretty good. (Apologies to my non-Indian friends here, but this is regarding a massive anti-corruption protest in India). 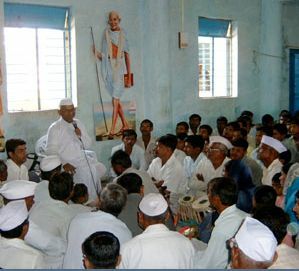 "Kisan Bapat Baburao Hazare, born 15 January 1940, popularly known as Anna Hazare, is an Indian social activist who is especially recognized for his contribution to the development of Ralegan Siddhi, a village in Ahmednagar district, Maharashtra, India and his efforts for establishing it as a model village, for which he was awarded the Padma Bhushan by Government of India, in 1992." This is not only a quick summary of who Anna Hazare is, but also an excerpt from his Wikipedia page. His Wikipedia entry offers exhaustive details on Hazare â€“ right from his early life and times in the Indian Army to the draft of the Jan Lokpal Bill. India holds 87th place in Transparency International's (http://www.transparency.org/) latest ranking of nations based on the perecption of corruption. The country fell behind three places from last year in the wake of funds reportedly mishandled during the recently held Commonwealth Games. The least corrupt country in the world is believed to be Denmark as per the rankings, followed by New Zealand and Singapore. The Internet played a key role during the Jasmine Revolution in China; to the extent that the word 'jasmine' and related searches were blocked by China Mobile and China Unicom. In Egypt, Twitter and Facebook in particular and the Internet in general, were used in the massive anti-government protests. When the Egyptian government tried to block social media sites and the mobile phone network, it failed miserably. BBC said the act of censorship was 'spectacularly unsuccessful'. The Hazare movement is yet to garner that momentum; but this is probably the first time anti-corruption has become a mass movement in cyber India. May democracy rule the Web! And the country!